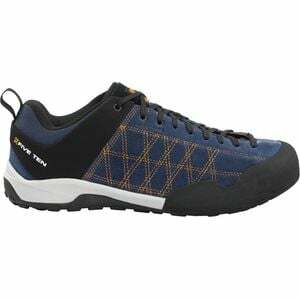 Product Condition: The Guide Tennie Approach Shoe - Men's is in Excellent condition. These shoes were previously owned for three weeks. The following observations were made regarding these item. *They were lightly used for an occasion. *There aren't any defects in them at all. *They got a little dirty with minor pet hair, cleanable. *All items sold as is, all warranties void. If your idea of a relaxing weekend is a ten-mile approach to a thousand-foot fourth-class ridge climb, then the Five Ten Guide Tennie is definitely the approach shoe for you. This low-profile, lightweight shoe has a Stealth C4 soleâ‚¬â€œthe same ultra-sticky rubber that's found on Five Ten climbing shoes. This shoe's incredible friction will make the approach slabs to Half Dome or a few pitches of 5.6 a walk in the park. Whether you're making a quick run up another North Cascades ridge climb or slacklining in Camp 4, your feet will be happy in the Guide Tennie.